Clearly Besotted has been creating little balloon images for every major holiday – see them all HERE. And see the new halloween one in this video! I got out my pencils; at first I was going to use white paper, but realized it would be “spookier” for halloween on black paper. Watch the video below or click HERE to see it in HD on YouTube! Love this card and even better on the black card stock. I know I’m a little late lol but I just made 2 of these cards. Sandy, your blog along with this video was terrific; thank you for the fantastic idea. It actually was my 1st time blending also using my Prismacolor pencils. Great video, awesome coloring, LOVE your card! 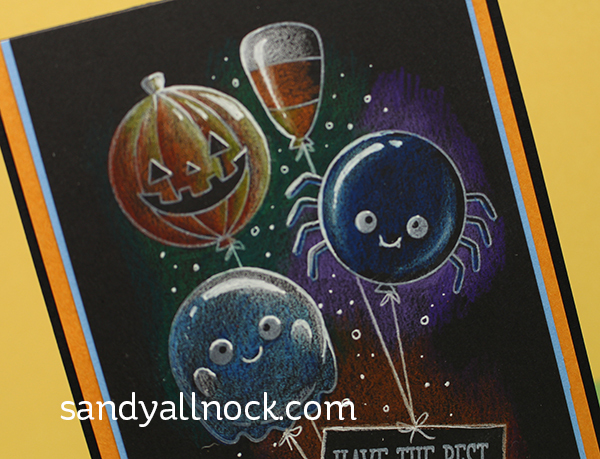 I have colored with colored pencils on black cardstock and love the effect. This card is really nice. The minute you added the white Signo – the balloons really began to glow. They appeared so dimensional like instantly. Just amazing. I loved the pencil on black! I ought to think about coloring on black paper! Thanks for the video! I love the contrast in this card as well as the light. Thanks Sandy! Just plain fabulous. Thanks for the great video. I simply HAVE to try this. Thanks for the really wonderful design ideas. Love your card & your coloring!!! Great video tutorial!! I am pretty sure I already commented on this post but it is worth doing twice! I am in awe of your work! TFS! Very cool! I’ll have to try this! 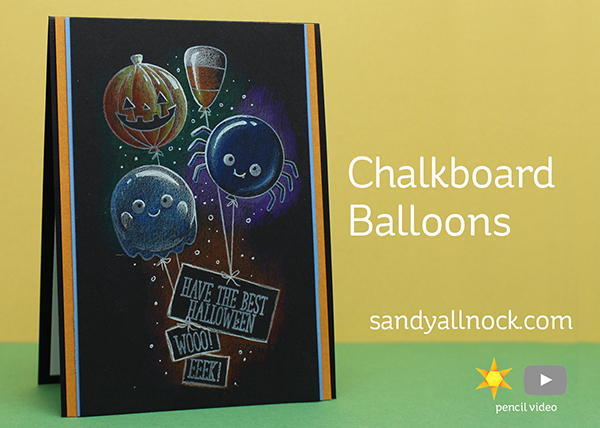 Who doesn’t like balloons – and who doesn’t love Halloween?! Kids and candy – dressing up like what you’re not – too much fun. You were inspired when you reached for your pencils – or just a really good artist, perhaps! This is where I struggle – I tend to forget I have choices, because for so many years, it was just water-based markers and aqua pens. I love the colors I get blending with Copics – but something like this is a whole ‘mother layer above that! Gotta try it – thanks for such a sweet, easy idea. PS – I’m sure somebody’s gonna point out that you got the colors of the candy corn balloon turned around a bit, color wise – but I don’t think you’ll be fined for it…! Oh wow! Such adorable card!!! !